It’s 5:30 am and the sun is rising above the Dry Forest of Guanacaste in northern Costa Rica. 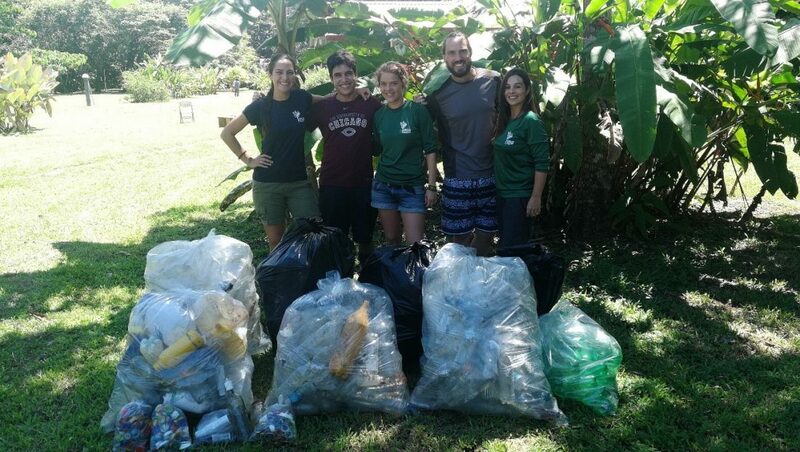 Researchers in Naranjo beach in Santa Rosa National Park in Guanacaste Conservation Area are getting ready to survey the beach. They walk along the shore looking for evidence of the presence of jaguars. 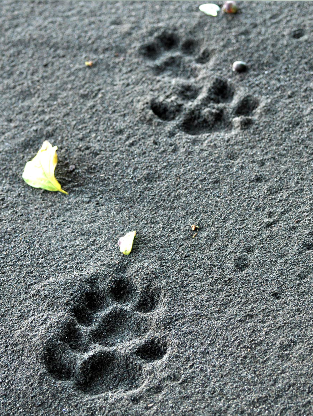 Unlike in the Osa, at this beach it is common to encounter tracks left by jaguars who patrol the beach looking for prey. Jaguar tracks along Sirena beach in Corcovado National Park. 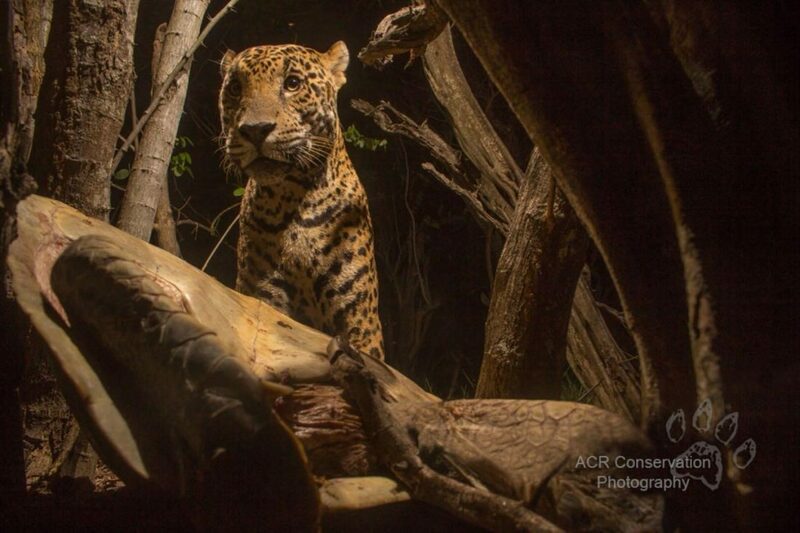 Not many people know that sea turtles are a common prey for jaguars. Sea turtles are quite fast and agile animals in the ocean, but quite slow and clumsy on land. So when the females come to lay their eggs on shore, they are quite helpless, making them perfect prey for a jaguar. 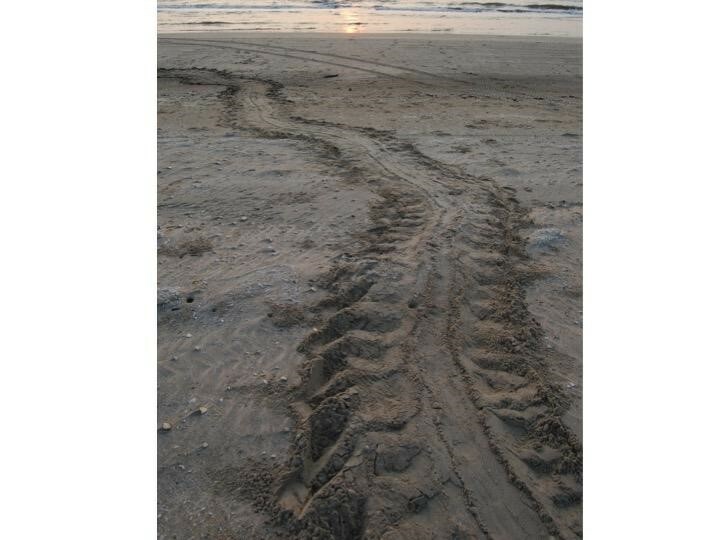 In order to track this type of activity, researchers walk along the beach often in the mornings, documenting tracks of sea turtles who came to shore the night before. Researchers can not only tell which sea turtle species were present based on their tracks, but even more importantly, whether or not the turtle returned to the ocean. 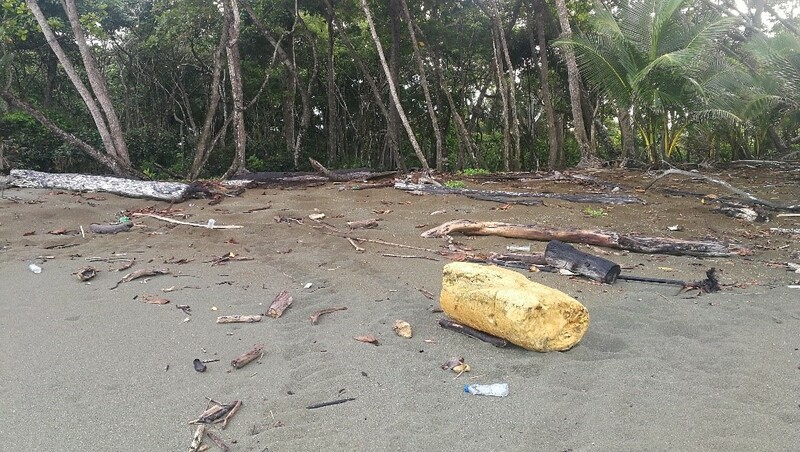 With no clear return path, it is likely the turtle was predated the night before and the researchers will then begin their search for a carcass as proof. 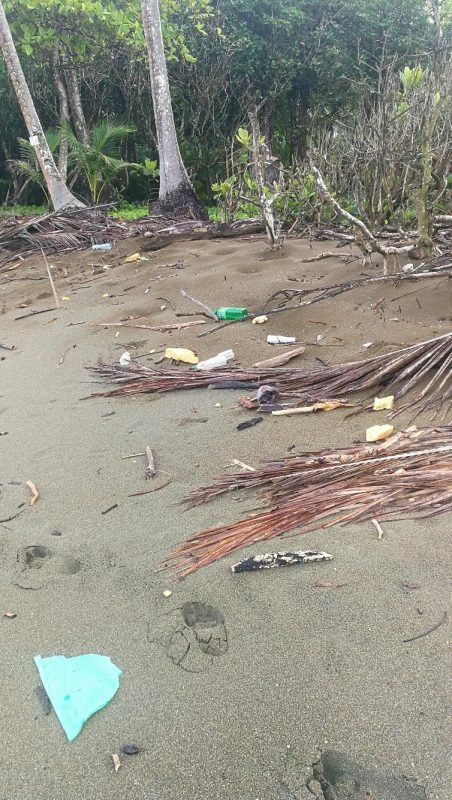 Sea turtle tracks in Naranjo Beach, Guanaste Conservation Area. 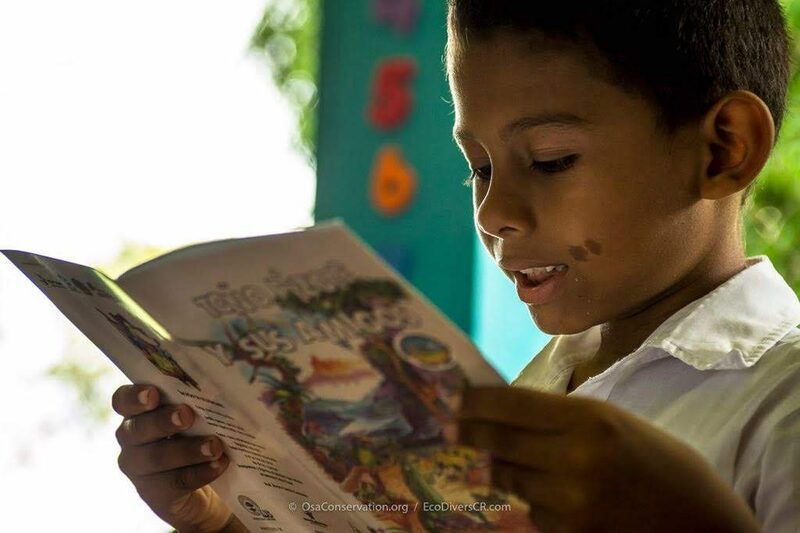 Guanacaste Conservation Area is one of the few places in Costa Rica where sea turtle predation by jaguars has been reported, as well as Tortuguero and Corcovado National Park. In fact, our neighbor, Corcovado National Park, was the first place where this phenomenon was reported. In the 1990s, researchers found that jaguars in the park changed their behavior, transitioning from diurnal to nocturnal during certain times of the year, which happened to coincide with the peak times for sea turtle nesting at the beaches in the area! This change suggests that sea turtles are a regular natural prey for jaguars and probably have been for thousands of years. 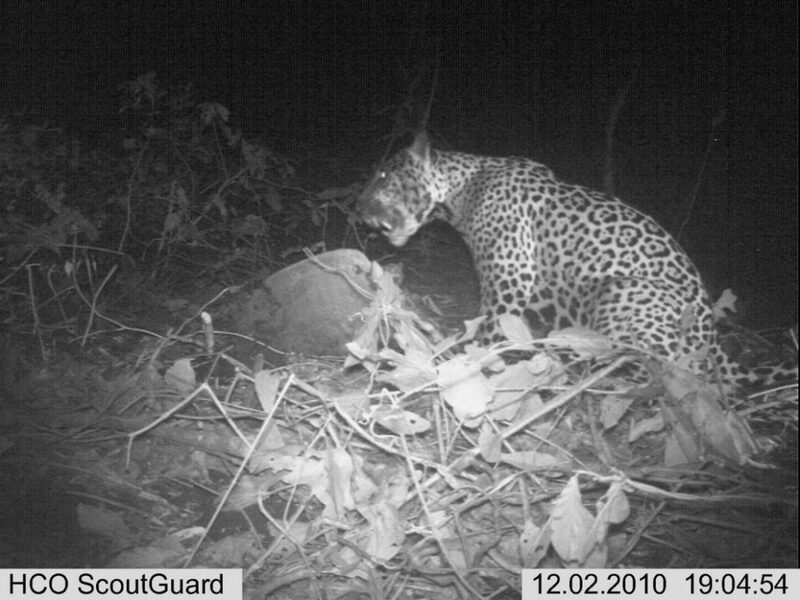 A camera trap picture of a jaguar with its olive sea turtle prey on Naranjo beach in Guanacaste Conservation Area. Even though sea turtle predation is common along areas where jaguar distributions overlap with sea turtles, this natural predation does not represent a serious threat to sea turtle populations. Jaguars take about 30 turtles per year in Guanacaste and about 20 per year in Corcovado. Jaguars are also the only big cat known for this behavior, probably because they have the strongest bite among all the big cats, and crushing the turtles shell demands great strength. 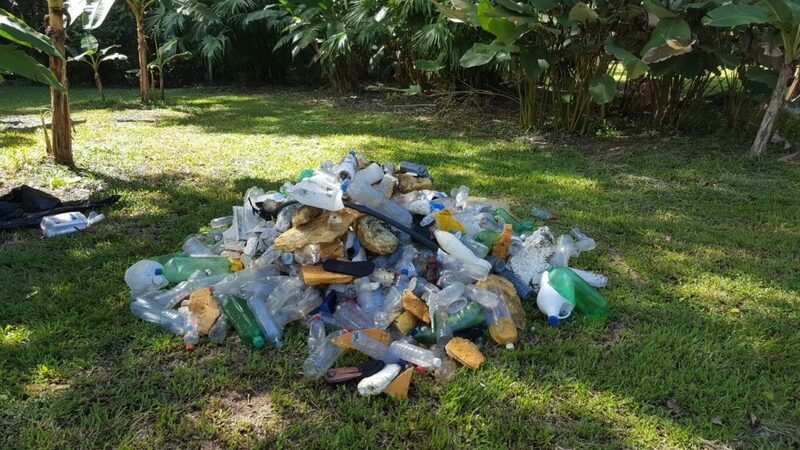 It is now eight in the morning back in Guanacaste and researchers have just found a green sea turtle that was recently killed. 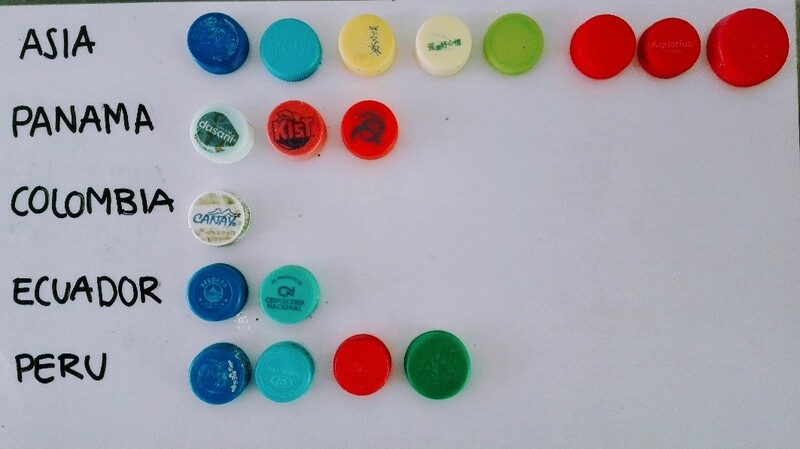 After identifying the species, taking photographic records, and collecting shell measurements, researchers mark the shell as to not count it again in future surveys. Finally, they set up camera traps on site in hopes of identifing the jaguar that will come back to feed later that night. Jaguar and olive ridley in Naranjo beach in Guanacaste Conservation Area (Photo credit: Alonso Sánchez). While this specific jaguar behavior has only recently been studied, it has brought new and exciting information about variables that might explain other behaviors about jaguars, including habitat use and even tolerance of other jaguars in the same site. Such research is also helping to create awareness of the delicate balance of ecosystems and how species that may seem to be very different depend highly upon one another within the ecosystem. 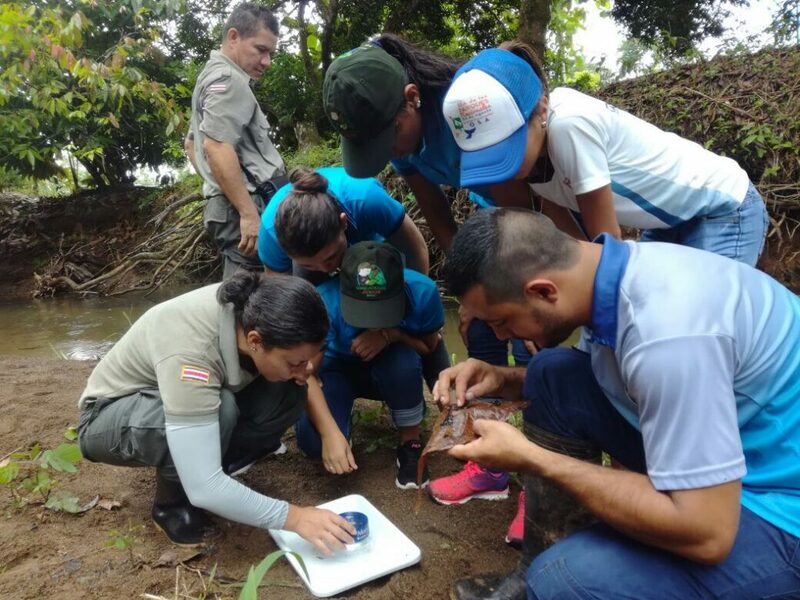 Osa Conservation has collaborated with Corcovado and other national parks and partners as part of the Osa’s Camera Trap Network. Camera traps help research projects like these to collect evidence and learn more about the behaviors of Costa Rica’s wildlife and wildcats. To learn more about the Camera Trap Network and the work that Osa Conservation does to study and protect jaguars and other big cats, click here. It was a windy fall day when I joined a group of budding field researchers and nature enthusiasts to visit the Rocky Mountain National Park for the first time. As we hiked the trails, I was in constant awe of the breathtaking front-range views and the abundant wildlife, ranging from elk to butterflies to marmots to hummingbirds. But it wasn’t just the wildlife that left an impression on me. As I was browsing the gift shop before leaving, I happened upon a Junior National Park Ranger induction ceremony that was taking place. 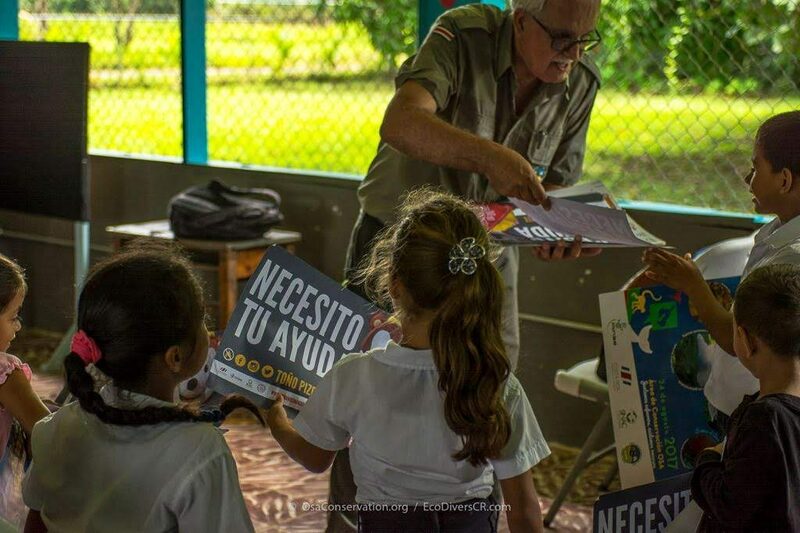 As the middle schoolers received their badges, I could see how proud and excited they were, and imagined how happy I would have been if, at age 11, I could help protect the incredible ecosystem I had just walked through. Flash forward, I’m at another Junior National Park Ranger induction ceremony. 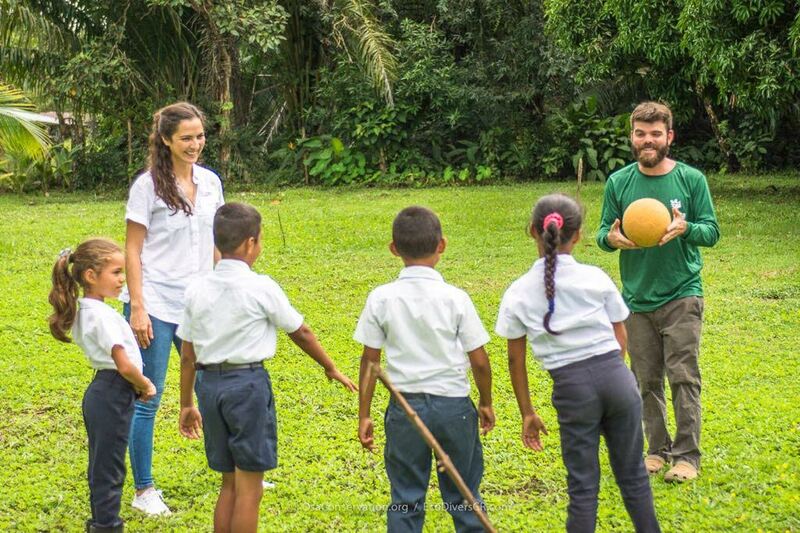 This time, however, the students are Costa Rican, and they are joining the Guardaparque Junior program. Modeled after the U.S. 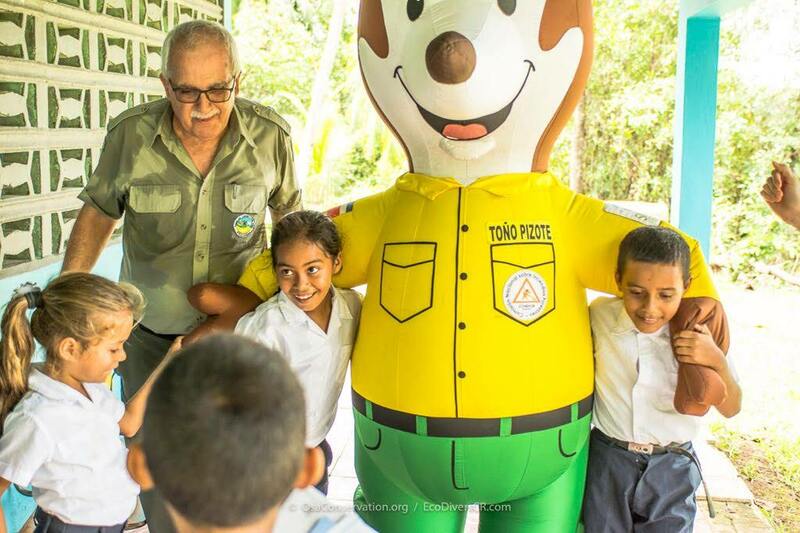 Junior National Park Ranger program, Costa Rica’s Guardaparque Juniors program teaches students to “Explore, Learn, and Protect!” national parks and reserves in Costa Rica. The program aims to form the next generation of community leaders and conservationists by educating them on the complex interactions between society and the environment. 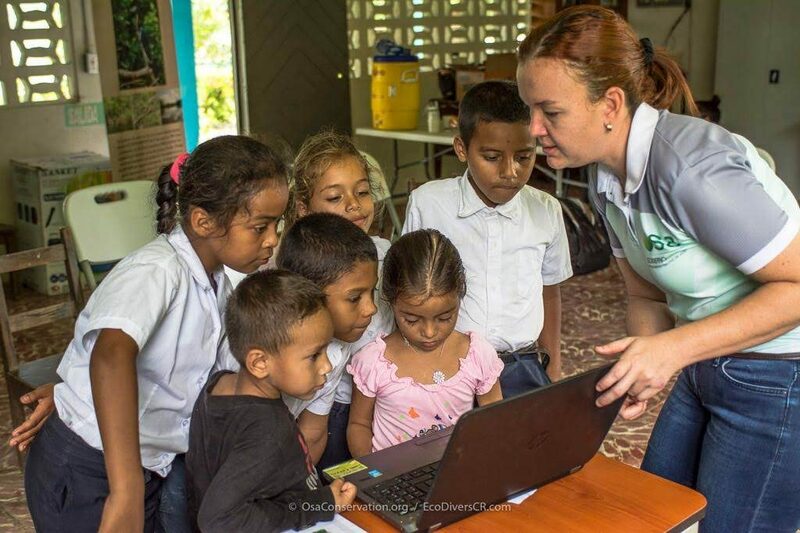 The National System of Conservation Areas (SINAC) is spearheading this pilot program with the support of local non-profits, including Osa Conservation. 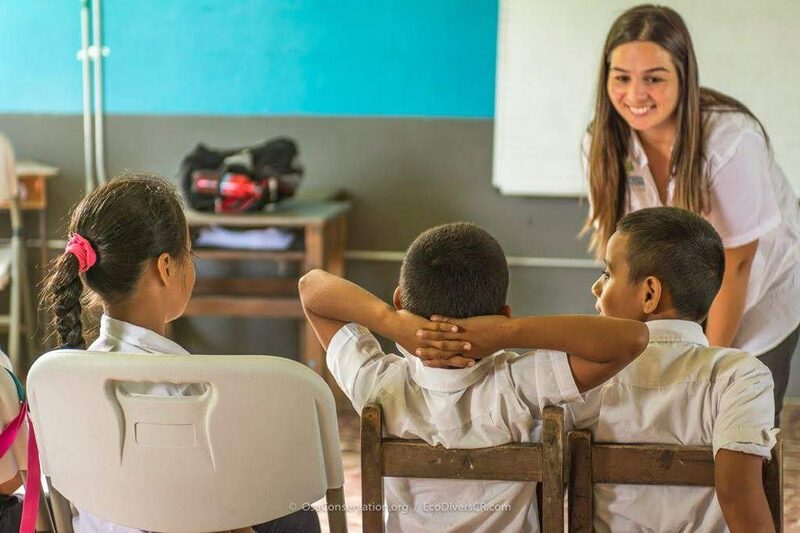 Hilary teaches Guardaparque Junior students to identify macroinvertebrates, mini might-beasts whose diversity indicate river health, in the river that provides most of the water for the La Palma aqueduct system. 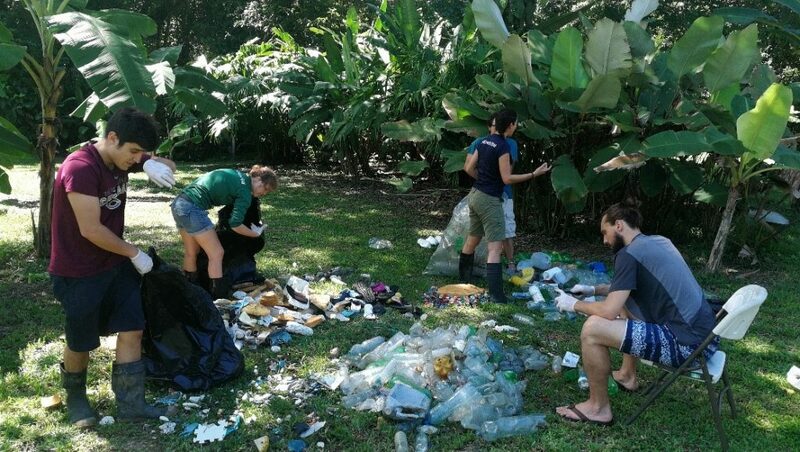 The first workshop for Guardaparque Juniors from La Palma High School focused on freshwater, from montane forest streams to home taps. Because freshwater conservation incorporates ecological study with social, economic and political factors, we at Osa Conservation thought it would be a good way to introduce the students to complex conversations about conservation. 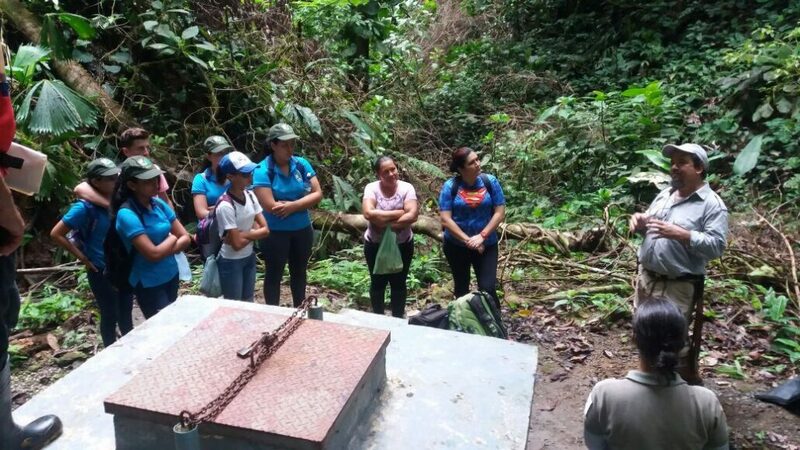 To illustrate how freshwater conservation affects their lives, administrators of ASADA La Palma (local aqueduct administration organization), SINAC and I took the students to the source of the stream that provides water for most of the La Palma area. I felt like a Junior Park Ranger myself as we trekked through lush old growth forest to reach where the stream fed into holding tanks and an automated chlorination system—the source of the water whenever the students turn on the taps of their kitchen sinks at home. Guardaparque Junior students, ASADA La Palma administrators and SINAC environmental educators identify macroinvertebrates they collected from the river. Guardaparque Junior students performed a pH test and found that the river water chemistry was neutral, which is in the healthy range. 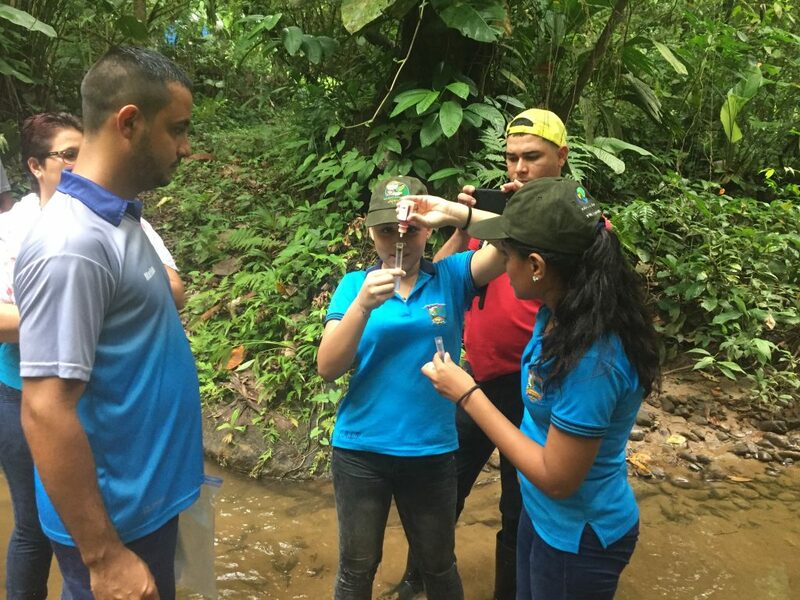 To confirm the health of the stream, the students and I worked together to analyze the water chemistry and searched the rocks and leaf litter for macroinvertebrates, insect larvae and shrimp whose diversity indicate the health of the river. Then we followed the river downstream as it passed through cattle pasture and the bustling center of La Palma, where we repeated our mini-experiment. We found significantly lower macroinvertebrate species richness, which demonstrated how the river is adversely affected by deforestation and urbanization. 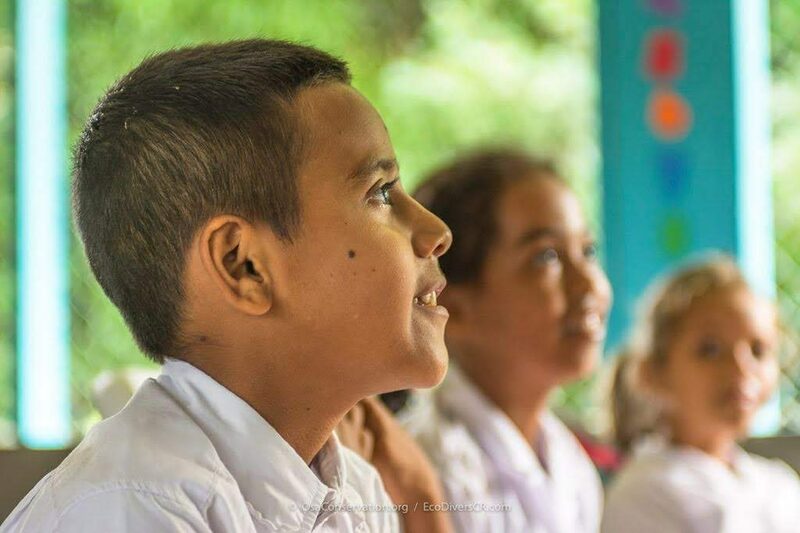 Renowned Osa botanist Reinaldo Aguilar explains that healthy forests are essential to river health because they provide nutrients, prevent erosion, regulate temperature and filters toxins. Programs like the Guardaparques Junior and the Junior National Park Rangers are essential to nurturing the next generation of conservationists because they engage students and bring them outside. 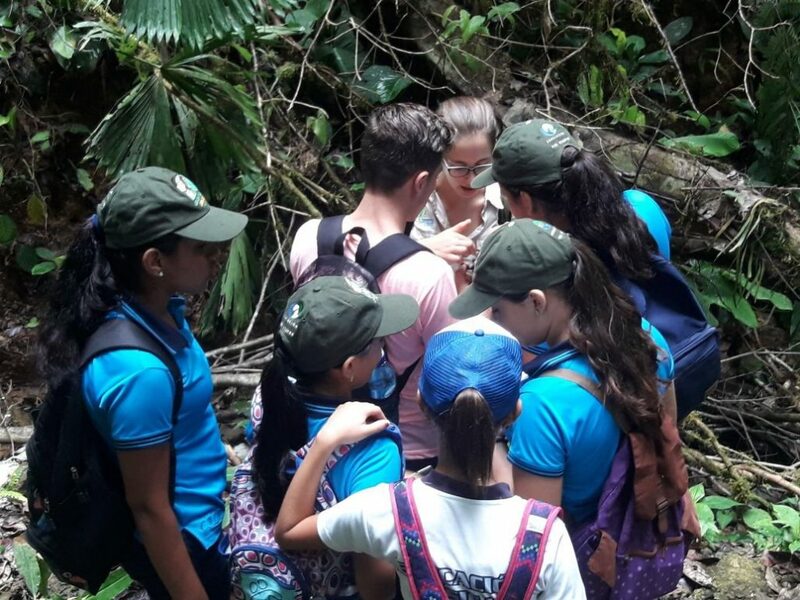 By the end of our workshop, the Guardaparque Juniors had a new perspective of how the health of the river and the health of La Palma’s residents are inextricably linked. 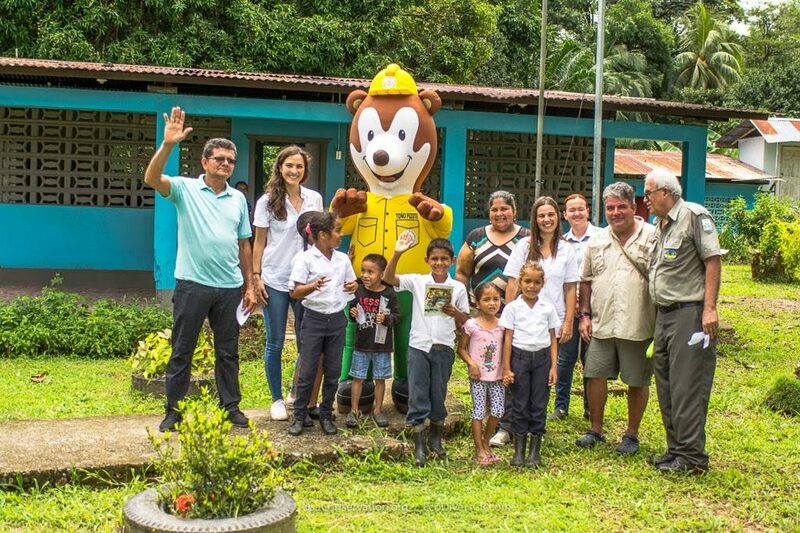 The next time they turned on the tap, it would be with the understanding that they have a part to play in keeping their town’s water clean and preserving the health of the forest that provides it.